WBAI’s fall fund drive is coming to an end, which means you have one more chance to pledge for the DVD of our “Who Owns Music” panel discussion from earlier this year. Even a relatively small pledge of $5 helps a lot and sends the message to station management that people want to hear jazz and will support it. Now let’s see what else is going on musically this week. Pianist Vijay Iyer is at the Met Museum of Art on the 12th with Holding it Down: the Veteran’s Dreams Project. Bassist Christian McBride is at NJPAC in Newark NJ on November 12 and returns to play with vocalist Dianne Reeves on the 14. Both events are part of the James Moody Jazz Festival. The Doc NYC Festival from the 12-17th has several films of interest to jazz fans – and a few definitely to keep an eye on for Suga’ fans. The Sonia Sanchez documentary Baddd Sonia Sanchez, will get screenings, as will The Jazz Loft According to W Eugene Smith, culled from the extensive and eclectic ephemera of the photographer’s years in a Sixth Ave loft building frequented by several jazz luminaries, and Hustler’s Convention featuring members of The Last Poets. Saxophonist René McLean is at Sista’s Place in Brooklyn on the 14th. Trumpeter Hugh Masekela is at Monmouth University in West Long Branch NJ with Larry Willis on November 14 and the Landmark in Port Washington Long Island on the 15th. See our review of Masekela and Willis at Jazz Standard for a preview of what you’ll see. 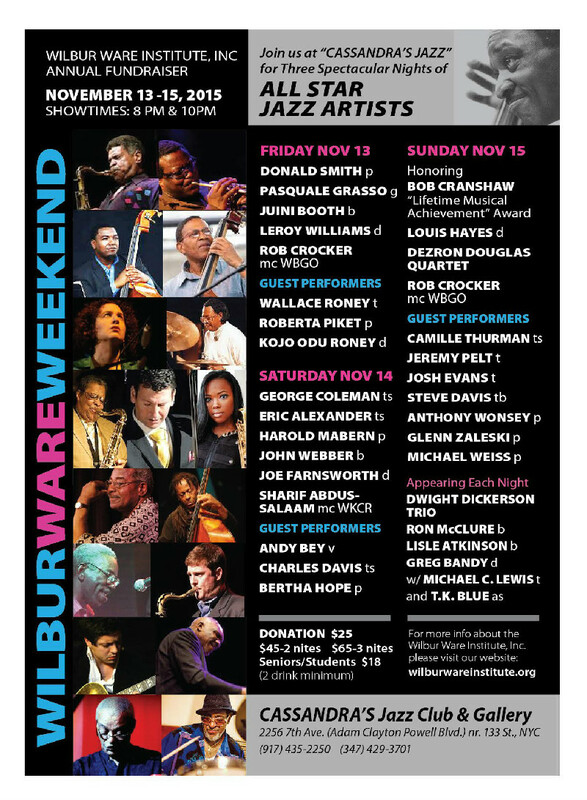 The Wilbur Ware Institute’s annual festival/fundraiser is at the new Cassandra’s Jazz club in Harlem this year and features pianist Harold Mabern and pianist/vocalist Andy Bey on November 14 and presents a lifetime achievement award to bassist Bob Cranshaw on the 15. Vibraphonist Roy Ayers is at the Blue Note from November 17-22. If you missed the weeklong run of Jeff Lieberman’s The Amazing Nina Simone documentary in NYC, you’ve got another shot on the 18th, when it screens at Huntington LI’s Cinema Arts Centre. Those of you (far) north of the city can catch it in Rhinebeck NY on the 20th and Woodstock on the 21st at Upstate Films. Drummer/percussionist Bobby Sanabria leads the Multiverse Big Band at Jazz at Lincoln Center’s Dizzy’s Club from November 19-22. That’s all for now. Suga’ in My Bowl is back on WBAI‘s airwaves on November 15. We’ll also have another edition of “On the Bandstand” online next Sunday with a fresh set of listings.